1. 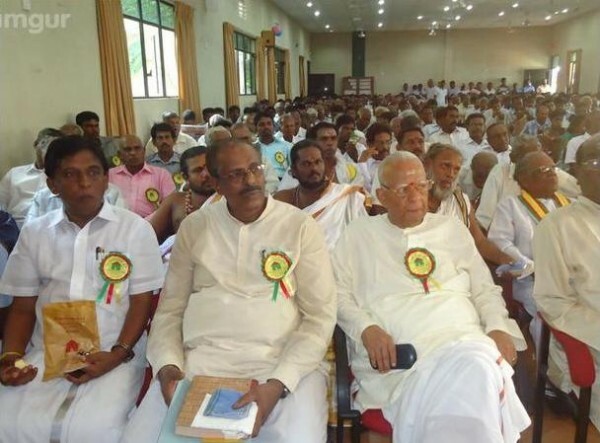 Discourage the activities of those ruthless people masquerading as genuine Sinhala Buddhist clergymen involving themselves in political, anti-social activities. This applies to all priests and ‘kurukkal’ and ‘mowlavis’ in every denomination. Some of these politicized monks garbed in so-called sacred robes behave in a shameful manner, both in parliament and outside. The whole world witnesses all this. If this is Buddhism, then outsiders have the right to find fault with everything happening in this island. Mere bashing of the West or any other part of the world will be meaningless unless the house is put in order. Denying of accusations and covering up cannot hold good for ever. 2. Buddhism is one of the noblest religions in the world, or if you would like to call it, one of the profound and practical philosophies in the world. In Lanka, there are millions of genuine and good and kind Buddhists, mainly comprising the Sinhalas and a few Thamilians and Burgers. Compassion and Metta are a few of the foundations admired by most of the South East Asian countries including our blessed Lanka. But also in this country, some extreme and misguided men posing as ‘Sinhala Buddhists’ unashamedly take into their hands the assumed power without any understanding of the world, or even understanding the Pancha Sila and the eight-fold precepts, on the premise that they belong to the majority. 3. The Buddha would have cried and wept if he had seen this ugly scenes in this Buddhist land where the vast majority of Sinhalas and other communities live in harmony. I see thousands and thousands of genuine Buddhists also visiting Hindu temples without any persuasion from outside. Many Hindus visit Buddhist temples on certain occasions. 4. In a fast changing world, we cannot live in splendid isolation and harp on the past, without understanding the realities of the present. The future belongs to the younger generation who think differently. I say this out of experience, though it is a limited one. I have taught in some international schools in Colombo and noticed that young students from various communities without any labels affixed on them. Even in state schools and private schools, most students have an international outlook. 5. The government should take bold steps to dissociate themselves from those want to stick to ultra-nationalism concepts, from whatever communities they come from, because most people would want a dynamic world, rather than live in the primitive past. 6. I sincerely request some of the Sinhala intellectuals whom I respect for their contributions to Sinhala culture and knowledge to please not upset the apple cart with their extreme patriotic feelings and domineering, so-called Sinhala Buddhist culture. 7. I must also add that the U-turn of the ITAK leader, going back to unattainable dreams has disappointed many. And that includes me as well. Most Thamilians in the North, who have suffered for no fault of theirs, because of the killings of innocent people by the armed forces, the Indian Jawans, the Tigers and assorted militants, of course cannot remove immediately the scars and the anger against oppressiveness. And they need psychological appeasement and comfort. But the ITAK and TNA are exploiting the people while they live in comfort. This is deplorable. Unknowingly or not, such leaders from the North will be the cause of future unnecessary deaths. 8. In the name of politics, so-called unenlightened politicians in the north, south, east and west are committing innumerable crimes, and are shockingly not arrested. Law and order has become meaningless in this anarchical situation. Impartiality is essential to punish or prevent such social crimes leading to death, corruption and all the evils in a decadent society. 9. The educational set-up in this country needs a thorough revision. Consultation with wise and experienced educationists should be sought, instead of leaving everything to the politicians who have many other activities to look into, than the future of children in the 21st century. 10. While South East Asia and even the Maldives have improved tremendously as nations with an international outlook like Japan and China in Asia, little Sri Lanka wants to go back to the glorious golden era of the monarchy of previous centuries. We cannot stand alone in this global world. We need assistance from the West as well as from other parts of the world, to even exist as a free nation.